The Emirates A380 aircraft made a historic touch down at the Kotoka International Airport’s Terminal 3, as a one-off service to the new terminal. The special Emirates A380 flight was operated by Accra-born Ghanaian, captain Solomon Quainoo and UAE national, first officer Faisal Alhammadi. 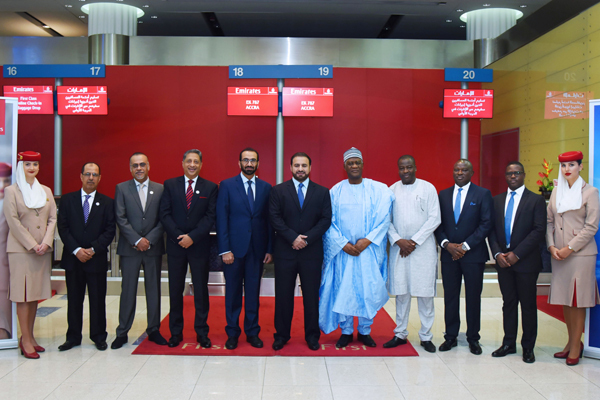 The A380 flight, operating as EK 787, was joined by a top-level delegation led by Orhan Abbas, Emirates’ senior vice president, Commercial Operations - Africa; Ahmed Ramadan, ambassador of Ghana to the UAE; Simon Atieku, vice council of Ghana (Dubai & N.E) - Consulate General of Ghana; Akwasi Abayie Adomako, minister – counsellor and deputy head of Mission Ghana; Hesham Abdulla Qassim Al Qassim, CEO, Wasl Group and vice chairman ENBD; Vinay Malhotra, CEO, VFS; Lt. Col. Ibrahim Hamad Ibrahim Abdalla Al Maazmi, Department of Naturalisation & Residency Dubai; Majed Sultan Murad Ali Al Joker, executive vice president corporate affairs, Dubai Airports. Upon landing at Kotoka International Airport in Accra, the aircraft was met with a ceremonial water cannon salute, and the Emirates delegation was welcomed by government officials and airport executives. After a welcoming ceremony, government officials, VIPs, media and members of the travel industry were given a guided tour of the A380 by Emirates cabin crew. Emirates commenced operations to Ghana in January 2004 and flies to Accra daily from Dubai. Close to 1.6 million passengers have flown the Dubai – Accra route since its start, with popular destinations being China, India and the UK via its Dubai hub. Since 2006, Emirates SkyCargo has transported a total of over 73,000 tonnes of cargo from and into Ghana. The air cargo carrier has facilitated exports of over 41,000 tonnes from the country in the same time period. Major commodities exported include fruits and precious metals.